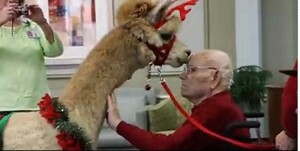 Napoleon the alpaca nuzzles the forehead of Bill Vestal, 95. A short video from the Sisters of St. Mary of Oregon has gone viral — by Oregon Catholic standards. The 58-second piece documents the visit of Napoleon the Alpaca from Mountain Peaks Therapy Llamas and Alpacas. The cute creature is done up in antlers for the Christmas season and delights residents, who pet him and smile. At the end of the video, Napoleon nuzzles the bald pate of Bill Vestal, a 95-year-old resident, sending the room into buzzes of delight. As of the start of the year, the video had been viewed almost 93,000 times. Comments have come in from around the world.